Summary: A heart-wrenching yet ultimately uplifting story of psychological suspense in which a parent is forced to confront what he does—and does not—know about his teenage son, in the vein of Reconstructing Amelia, Defending Jacob, and We Need to Talk about Kevin. 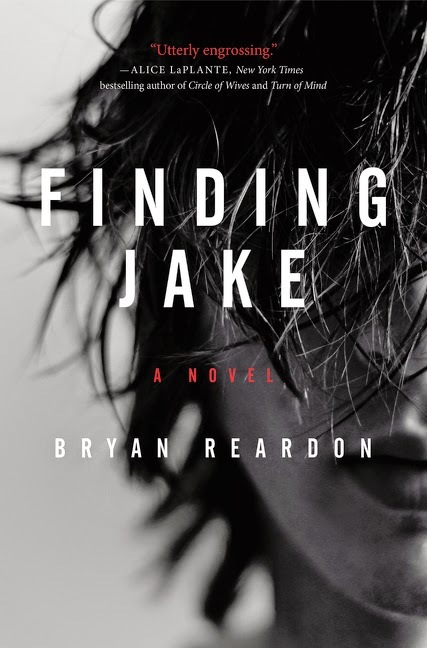 I honestly don't know why I picked up the novel FINDING JAKE by Bryan Reardon. As I look back at the book's description, I must have been attracted to the psychological suspense aspect of the story. Maybe it's because they compared this novel to three books that I read and loved. But for whatever reason, I am pretty sure I didn't know how gut-wrenching this story would be to me! FINDING JAKE tells the story of a stay-at-home father, Simon Connolly. His wife goes to work as a lawyer every day while Simon stays home taking care of his two teenage kids, Jake and Laney. One day, Simon is shocked to learn that there was a shooting at the high school. He immediately drives to the designated meeting place and waits for Jake to arrive. Jake never arrives and Simon discovers that he is a suspect in the shooting! Simon reflects on Jake's past and present, and he begins to question if he ever even knew his own son. Simon starts to actually doubt Jake's innocence and even blames himself for allowing Jake to hang out with one of the shooters. Simon's obsession with finding Jake's and learning the truth begins to take over his life -- eventually causing even more tension in his strained marriage. As a mother, I have to admit that many of the events that occurred in FINDING JAKE were almost nightmarish to me. I think in today's society we all have a little fear about a kid (or kids) going crazy and being involved in a school shooting. However, for Simon that nightmare was even worse. The media and the police (and fellow students and parents) actually thought that his son Jake was part of the problem. I think it's a testament to the author that I found FINDING JAKE to be so real... and therefore so depressing. What I most appreciated about this novel (because enjoy just isn't the right word) is how honest it was. I actually could feel Simon's pain and fear, and I know I might have reacted the exact same way if I were ever in a similar situation. We all think we know our kids, but do we really? And as far as doubting my own abilities as a parent, I am absolutely 100% sure that I would be doing that as well! FINDING JAKE was a difficult read for me. Between Simon's concerns about Jake, Jake missing, and the tension in Simon's marriage, I just felt uncomfortable for most of the novel. Fortunately, the ending made the entire read worthwhile. Had FINDING JAKE not had some positive themes of faith, healing, and redemption, I would have either cried my eyes out or thrown the book at a wall. Another aspect of the story that I enjoyed was the mystery surrounding the school shooting and Jake's disappearance. I felt that Simon's feeling and Jake's behavior through the years was the primary focus of the novel; however, the suspense aspects were very well done; and they definitely contributed to my appreciation of the story. FINDING JAKE would make an excellent book club pick. There are so many things to discuss, especially for parents of teens! There is a reading guide available with fourteen thought-provoking questions. Some of the topics you might want to explore include parenting, marriage, faith, personality, introverts vs. extroverts, responsibilities, and judgments. I appreciated FINDING JAKE and recommend it to fans of literary fiction and/or mysteries. Oh wow, that sounds gut wrenching for sure! I read this one and felt much the same as you. Don't have a teen anymore, but it was easy to place oneself in the father's shoes. I think it would be interesting to do a comparative read of this book and Defending Jacob. Both teenage boys. Both accused. Both told primarily from the viewpoint of the father. Have you read that one? This sounds like a good book but I don't know if I could read it. It does sound like a difficult one.